"I'm here, Grandma," the little girl said. "Hello dear. I'm glad you came," said Grandma. "I've brought you some lunch," said the girl. "Shall we eat?" said the girl. Does this writing sound familiar to you? It's not so much the content but the repetitive use of the word said. "I'm here, Grandma," the little girl called. "Hello dear. I'm glad you came," replied Grandma. "Shall we eat?" asked the girl. "I'm here, Grandma," the little girl yelled. "Hello dear. I'm glad you came," cried Grandma. "I've brought you some lunch," shrieked the girl. "Shall we eat?" replied the girl. Like this example, students would randomly select a word from the chart assuming that each word has the same meaning as said. In fact, they do generally mean said but in different ways. This is way I have grouped the words into the loudly said words, the softly said words, the crying-type said words and the complaining-type said words. All students have to do is decide how their character is speaking and select a word from that category. This is a free download. May it help your students become excellent writers! Congratulations on your website. It is useful and nicely put together. However, I am a professionally writer. Actually, if your children intend to become authors, people will tell them that "said" is the norm. Agents will not consider their work if they use "shrieked, retorted, replied, etc." and other attributions. It is a sign that the writer is not a professional. 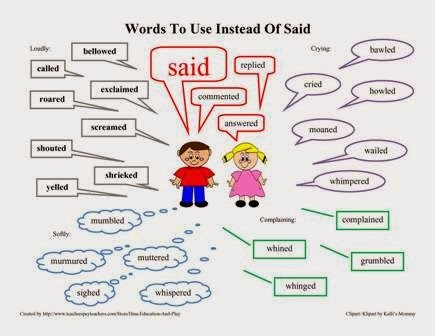 "Said" is not boring; it is used the same way punctuation is used, to make sure the reader knows who is talking. You want the reader to pay attention to what is said, not on how it is said. 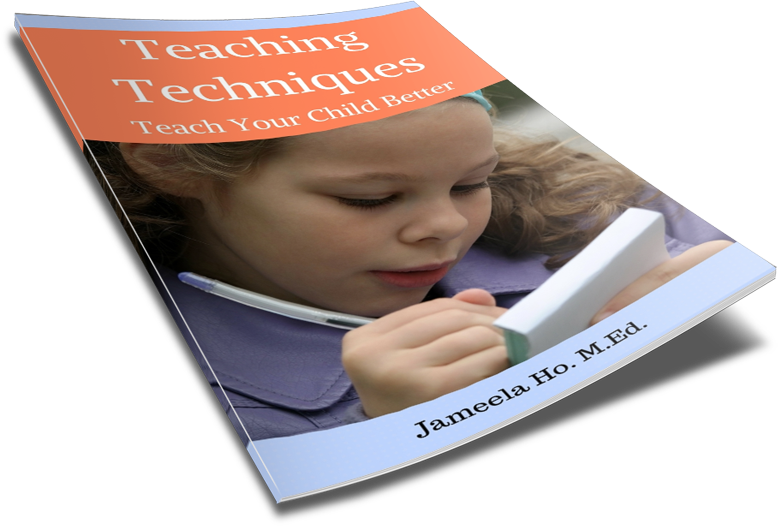 Teaching bad habits like those will not help your children write better. 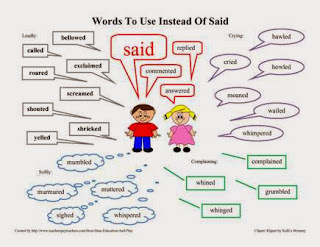 The same is true for adverbs and adjectives and exclamation marks (to use sparingly). I know you have been told differently by your teachers. At school, they teach you the worst habits sometimes. Thank you for that tip. It's good to know. So what would you suggest students do when they write half a page of He said, "--." She said, "--." He said, "--." She said, "--."? I have students from Year 1 to Year 6 doing this same thing.